In July 2012, I had the opportunity to go to New York to visit some Muffler Men that I had not seen before. My first stop was the Orange County Fairgrounds in Middletown to see “Chief Towaco”. This was an Indian Chief model that had been there since the 1970s. Originally, this statue was one of three Indian models installed at the Danbury Fair in Danbury, CT. Vintage photos show that this statue always had this strange looking, duct taped body. At that point, his head was in normal condition and stayed that way until the giant was taken down. I arrived at the Orange County Fairgrounds on the 4th of July only to find out that the statue had been removed and trashed just two days earlier! I was told that the head was saved by one of the men who helped take the statue down. The rest of the body was hauled off to the dump. While I was at the Fairgrounds, I checked out the giant fiberglass cow head and some neat lights which came from the 1964 New York World’s Fair. After that, I went to see the Muffler Man in Elmsford. 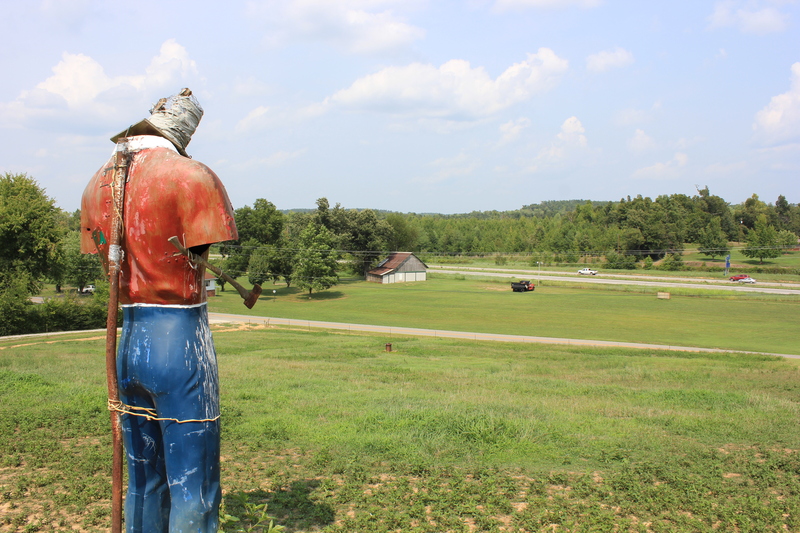 This Paul Bunyan model stands on North Central Avenue just off I-287. It has been there since at least the 1970s. From the style of the statue’s shirt sleeves and arms, this appears to be an early statue from the mid-1960s. The statue’s right arm has been missing as far back as anyone can remember. It’s possible that this statue never had one or it was removed to fit next to the sign. The statue was originally painted the standard Paul Bunyan colors with a red shirt and blue pants. By 2001, his shirt had been repainted gold. Around 2004, the Amoco station was rebranded as a BP station. The statue was painted green and yellow to match the new company’s logo. The statue’s eyes were also painted green and a flower planter was built around its feet. The statue is a classic Paul Bunyan and not the same style as Phillips 66 or or Texaco Muffler Men so I have my doubts this giant was purchased for the oil industry. I have yet to find out if this statue has always been at this site or if it was moved there from somewhere else. In 2007, a driver accidentally backed a truck into this statue and ripped the left arm off right below the shirt sleeve. The station owner put the arm in a storage room where it has remained ever since. Although I begged to see the arm, the clerk would not allow it. He said that the owner was going to reinstall the arm at some point. While there are a few Muffler Men around the country with missing feet, I believe this is the only one with missing arms. At the time of my visit, the gas station was being remodeled and the pumps had been removed. Hopefully, the statue is also on the owner’s “to do” list and that the left arm will be reinstalled soon. 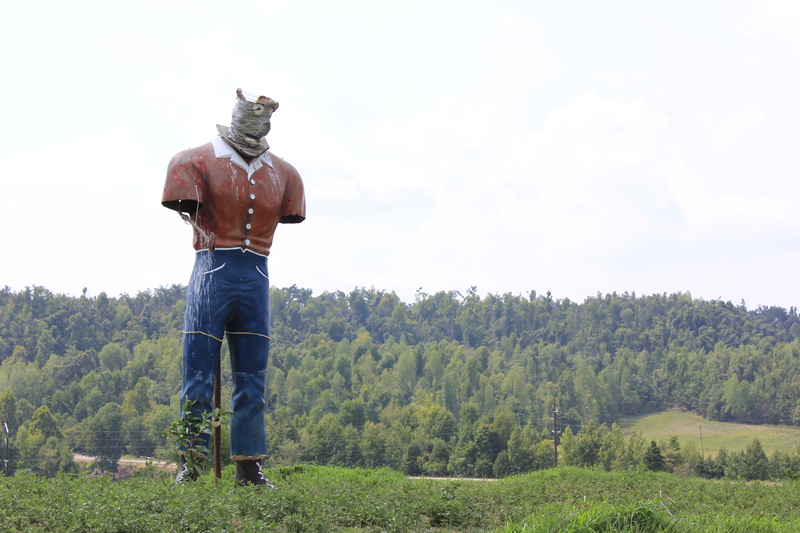 This 14 foot tall Paul Bunyan statue stands in a donkey pasture overlooking Pennyrile Parkway in rural Kentucky. These smaller statues are rarer than the 20 foot tall models. 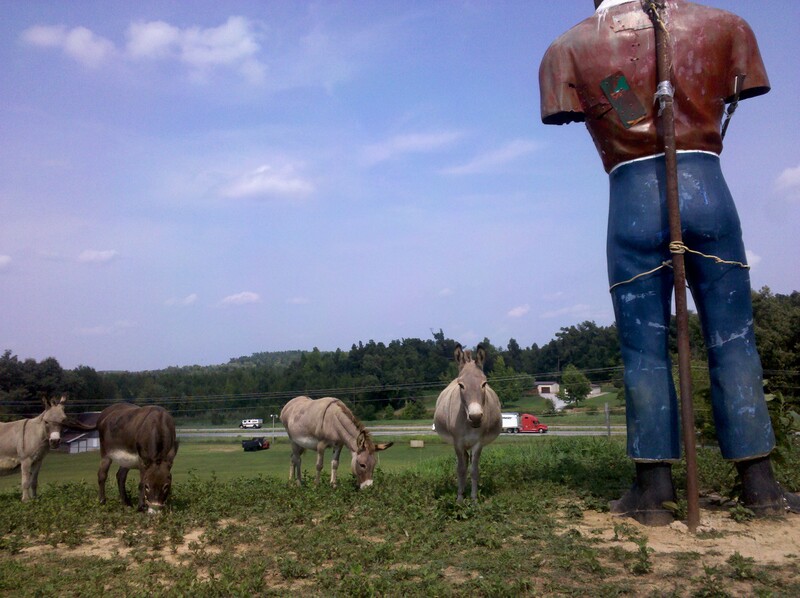 In 2011, someone saw the statue and posted a photo of it at RoadsideAmerica.com. This Muffler Man was missing his arms and had a crude looking head. When I got a chance to see this statue for myself, I noticed that the International Fiberglass label on its leg had been sanded off and painted over. A plaster and burlap bag serves as the statue’s head. An axe hangs from the statue’s right arm socket. This statue has a lot of cracks and breaks which have been patched together with old road signs and screws. The owners are interested in finding replacement parts and would like to restore the statue. This statue was produced in the late 1960s. However, it is not known where it was first installed. 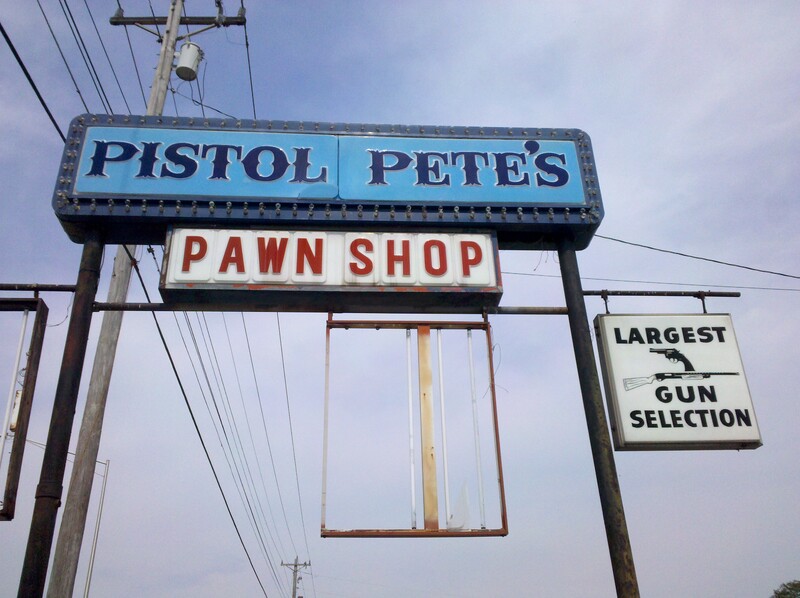 By the early 1990s, the statue stood at Pistol Pete’s Pawn Shop in Fort Campbell, KY. At that point, the statue was already missing its head and arms. The owner of the store, Robert Ladd, still owns the building. However, I have been unsuccessful in locating him. I searched the former pawn shop property and was not able to find any trace of the statue’s head or arms. 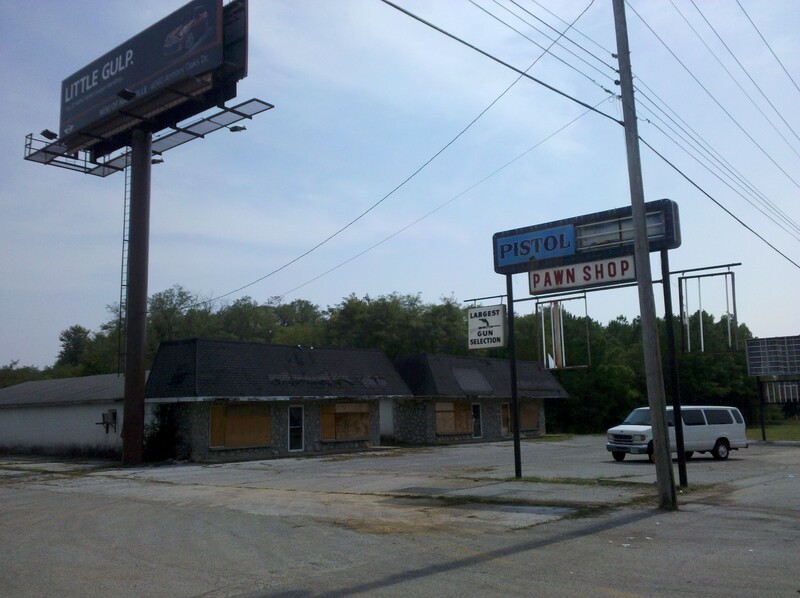 When the pawn shop closed in 1995, the statue was sold at auction. The man that bought him was having trouble loading the statue into his school bus. That’s when the couple from Mortons Gap bought it. They loaded the Muffler Man into their Ford Ranger and made the 40 mile drive home with the statue’s legs and feet sticking out the back of the truck. The statue has been standing on the hillside pasture since then. Although it is located on private property, there is an unobstructed view of it from the highway. If you have any photos or information about this statue’s history, please write a comment or send me an email at info@usagiants.com. 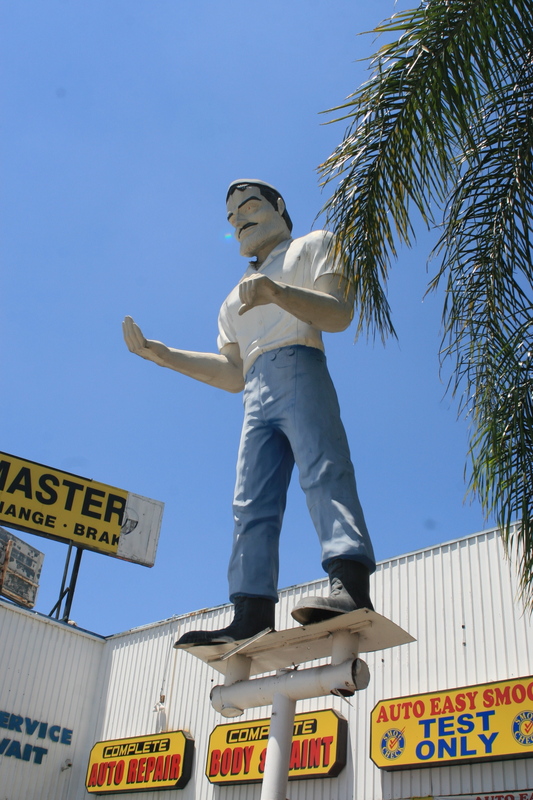 We are also currently running a Kickstarter to restore this Muffler Man and need your help! Visited my 16th muffler man on a hot July day which ended up being a big day for M Men, I think I saw a total of 5 that day. We started out here at Tune Up Masters and I talked to one of the employees who told me this Bunyan has been here for over 40 years now, which puts him as arriving around 1972 or before. He was more then likely ordered direct from International Fiberglass and I doubt he has ever left this corner since he came out of the shop a few miles to the south in Venice. The LA area has a population of 10 muffler men that I know of and this is not surprising due to the close proximity of their manufacturer International Fiberglass. I was told how this Bunyan survived the 1994 earthquake without a scratch while some of the buildings on his block did not fair so well. He stands today in faded paint and with a skin painted beard making him appear a bit odd. I guess if you want a clean shaved muffler man you can’t simply order that version anymore so painting over the beard is the next best option. Interestingly enough the bearded bunyan was the first version made by I.A. and when the cowboys and beardless guys came along later they simply filled in the beard on the mould with a plaster splash giving muffler men that nice recognizable lantern jaw. Reports on http://www.roadsideamerica.com mention he held some tires back in the day. No one has reported on this guy on their site since 2006 so someone post some new pics for us!